In Italy, it's called insalata Caprese -- salad in the style of Capri, the Italian island in the Tyrrhenian Sea, where the Caprese salad supposedly originated. It's a favorite dish of mine; so simple and yet so wonderful. Of course, simplicity of this sort requires the freshest high-quality ingredients -- nothing but fresh tomatoes, fresh basil, and fresh mozzarella will do. 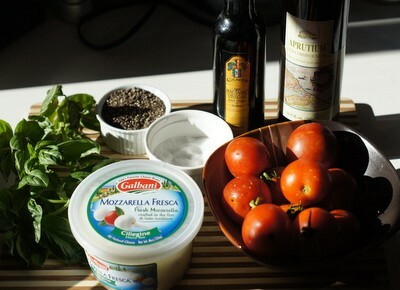 The Caprese salad recipe that follows was made with golf-ball-size heirloom tomatoes and basil from our garden. 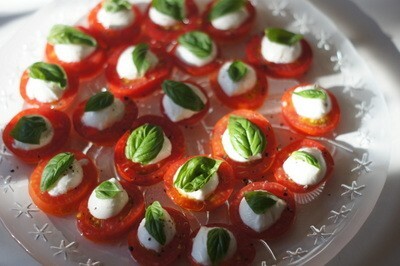 Hence, I call it a "mini-Caprese" since, more typically, large tomato slices are used. 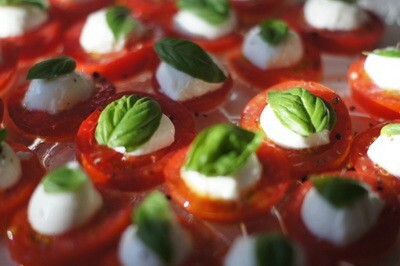 The bite-size nature of this Caprese salad makes it perfect as an hors d'oeuvre. I don't list quantities or amounts here, since you might want to make Caprese salad for two or two dozen; you can adjust the quantities to suit your needs. What follows is, basically, a set of assembly instructions. 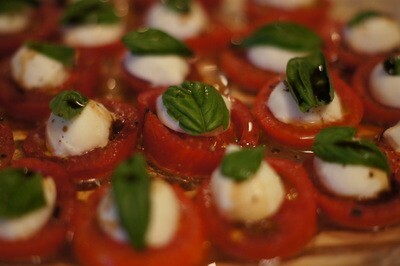 Note: the Caprese salads I've had in Italy had just a light drizzle of olive oil. Quite often though, I see it served here with balsamic vinegar, which I sometimes like. I asked cookbook author/instructor/consultant Marguerite Henderson, who spends a fair amount of time in Italy, if she sees Caprese salads served with balsamic there. She told me they usually just serve olive oil on the side, and only sometimes balsamic - usually for American tourists. "It's too acidic and it turns the white mozzarella brown," said Henderson of the balsamic. So, I suggest trying it with just olive oil, just balsamic, and with both to see which you like best. 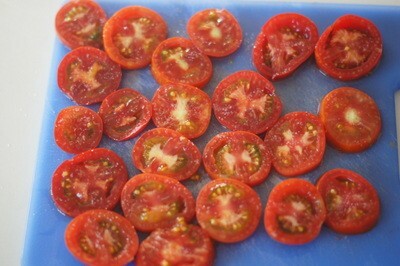 Cut the tomatoes into slices -- I like mine to be about 1/3-inch thick -- discarding the tops and stem. 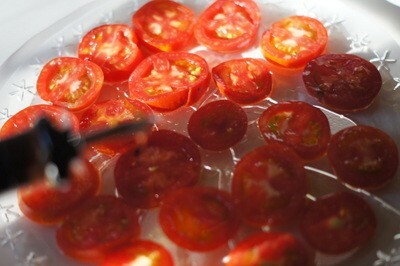 Sprinkle the tomatoes lightly with kosher salt. 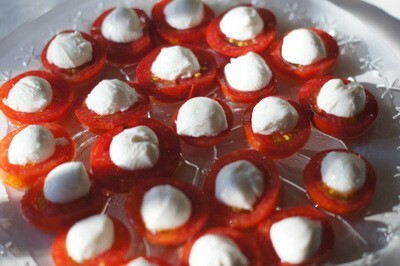 Place the tomato slices on a serving platter and drizzle them lightly with extra-virgin olive oil. 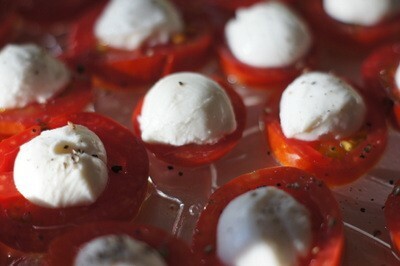 Cut the mozzarella into slices and place a slice on each tomato piece. Sprinkle the tomatoes with a little cracked black pepper. 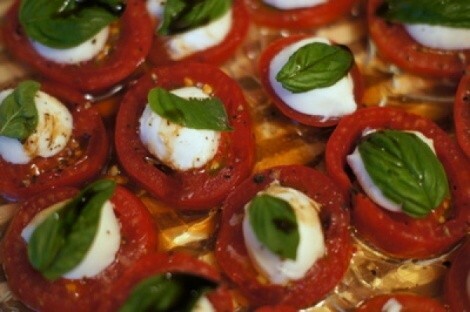 Top the tomatoes and mozzarella with basil leaves. 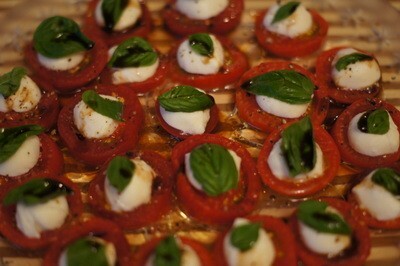 Finish the Caprese salad with a light drizzle of balsamic vinegar (optional) and serve.